I've come down with my second cold of the year and decided to take today off work and rest. I'm now 25 weeks preggo and find I get fatigued pretty easily - which likely led to me becoming sick in the first place. Being out and walking around in the cold rain for work probably doesn't help things either. Anyways, back when I found out I was pregnant the first time, I made the decision to not read any pregnancy books as they would likely cause me to stress out. A few weeks in, someone suggested that I read Ina May's Guide to Childbirth - it would be the only book I would need. I borrowed a copy from my midwife and have really been enjoying it. Some of it is a bit too hippy-dippy for me, but the main themes are pretty legit. Basically the main idea behind the book is that women are meant to give birth, but over the past 100 years or so the medical profession has taken over birthing deliveries much to the detriment of women (in North America). Midwives attend a very small percentage of births in Canada and the U.S. as most babies here are born in hospital under care of a physician. However midwives deliver the majority of babies in most European countries and in Japan. I have a number of friends in the UK who delivered their babies in hospital under care of a midwife. Since Ina May is American, most of the book focuses on the US birthing experience. This is dramatically different from hospital births here in Canada, most likely due to our different health care policies (I won't bother going into details). That said, I have lots of Canadian friends who have given birth in Canadian hospitals and some of the situations are very similar. I've heard of doctors prescribing lots of caesarians for women whose pelvises are "too small" for vaginal delivery - I don't think it's that common to have too small of a pelvis. In Guide to Childbirth Ina May points out that birthing position is critical to the ability to vaginally birth a child. Lying on your back (the typical hospital birthing position) makes it very difficult to push out a baby. Probably about 90% of the women I know that had their labour induced ended up having to get a c-section (caesarian). I've thought for years now that as soon as you start induction artificially and force the body to do something it's not ready for yet, you'll end up running into trouble down the line.... and c-sections are major surgery! I hope to avoid it at all costs. Hospitals (mostly in the US because of the powerful pharmaceutical companies, but probably in Canada too) tend to push drugs onto women in labour. I have a number of friends who are nurses and who have delivered babies and they all said that they recommend having an epidural as it relaxes the women and helps them rest so they are ready when it comes time to push. This sounds good. But another friend of mine had complications due to an epidural during her last pregnancy where it damaged the nerves in her vertebrae and now she has severe back pain. This is a few years later! Again, back to my previous point about messing with nature.... I hope to avoid using any drugs during my labour. Not because I think I'm Wonder Woman, but because I would like to just let my body do its thing. I feel like medical interventions often lead to really bad complications. So I will get down off my soapbox now (ha ha ha). In other SUPER DUPER exciting news... 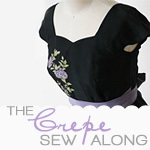 I won a giveaway on Bluejules Sews!!! She was giving away a copy of Pattern Magic to a lucky reader and it's meeeeee!!!! I'm so freaking excited I can hardly sit still. It was definitely the highlight of my day. I can't wait to make everything from it!!! I agree on the points you make about giving birth. We're lucky here that the doctors try to avoid C-section at all cost and that mostly midwives help during birth, doctors only interfere when necessary. I was hesitating between natural birth and epidural because I don't think I can handle much pain. But after I talked with a pregnant friend who's also a pharmacist, she said she's totally against epidural because that complicates labor and can have severe side effects. I still have a long way to go, but I think I pretty much made up my mind not to have an epidural or any other kind of drug during labor. I hope your cold gets better soon, I think I'm coming down with something too, and just as I'm going on vacation. Just my luck. Thanks, I managed to avoid the cold.